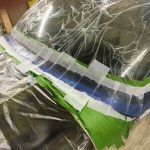 Vans calls constructing the canopy, whether tip-up or slider, one of the most challenging aspects of the build. Vans is always right. 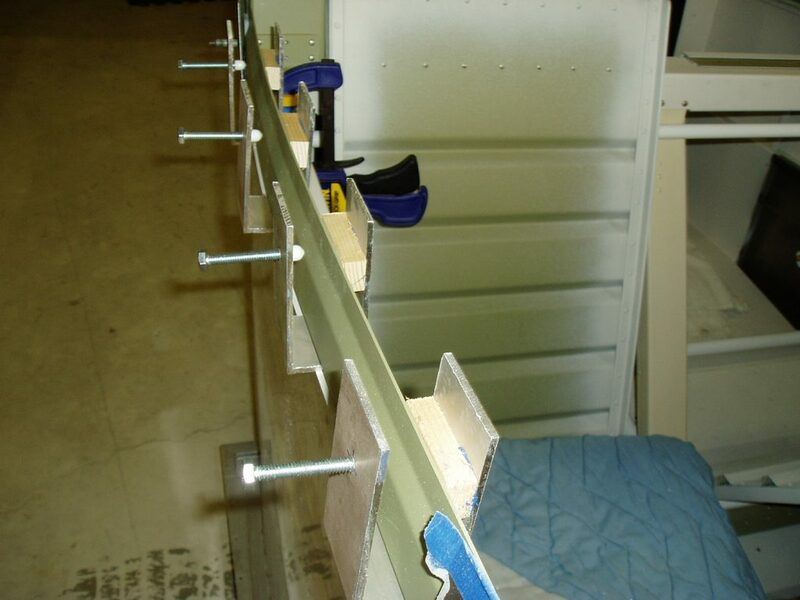 Our “tipper” began with drilling the HDPE blocks that are bolted to the fuselage and serve as hinge supports for the front of the canopy. These blocks support retractable pins that hold the front of the canopy in place. 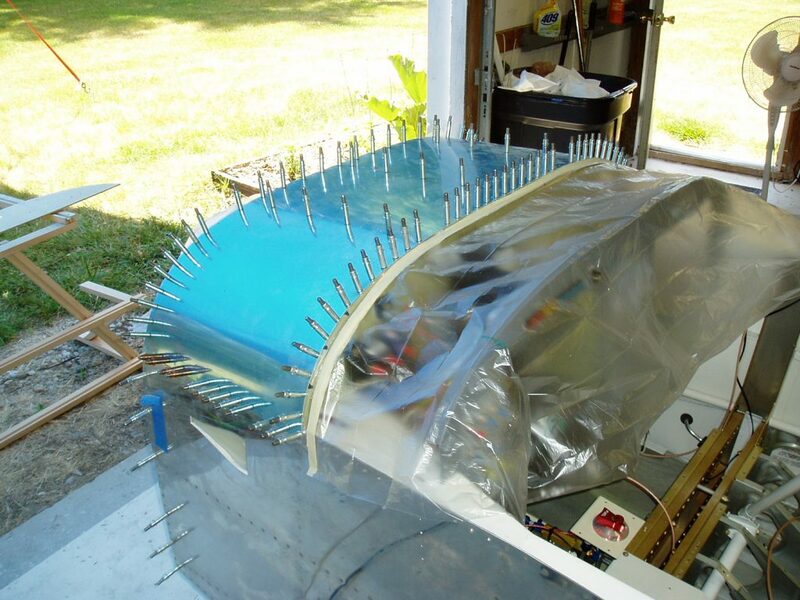 The retraction mechanism is controlled by a tee handle that may be pulled to release the canopy. 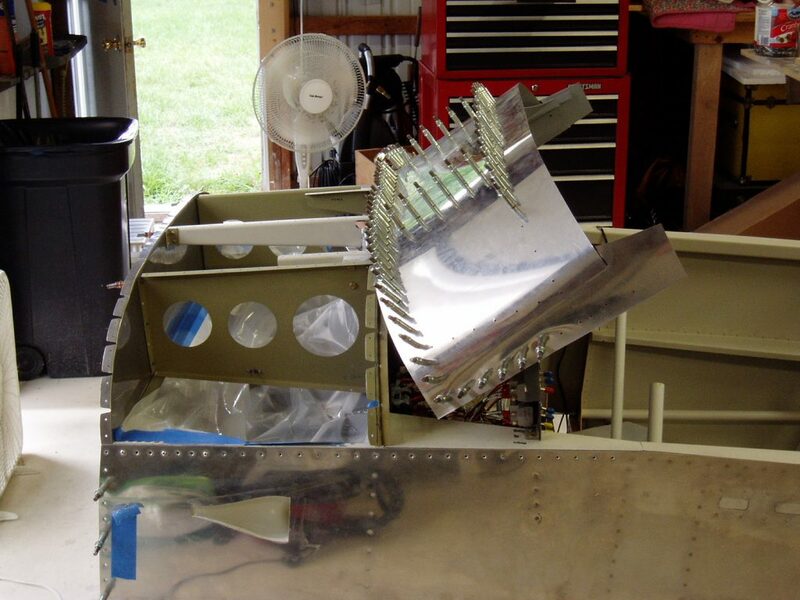 Builders who plan on doing aerobatics while wearing parachutes will place the tee handle on the instrument panel. Not having those aspirations, our handle is on the sub-panel where it is accessible on the ground by first opening the canopy. 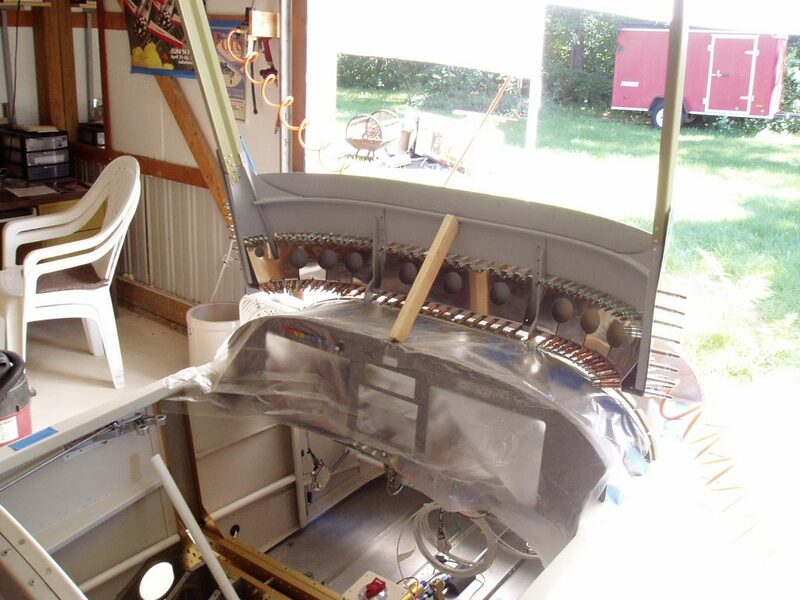 The top front skin had previously been match drilled to the instrument sub-panel, firewall and ribs. 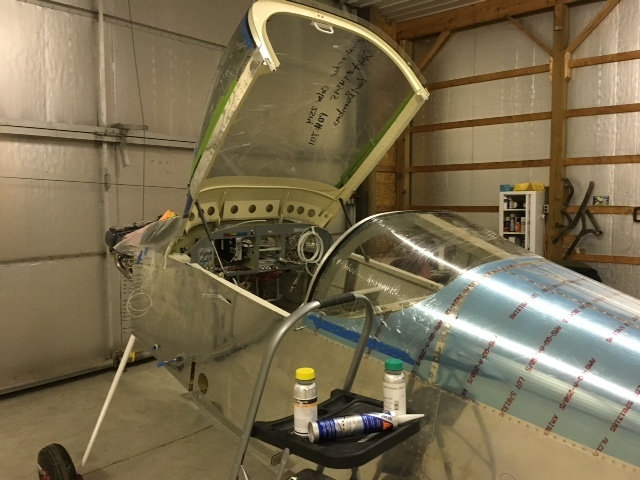 A skin was drilled and clecoed to the prefabricated canopy frame. 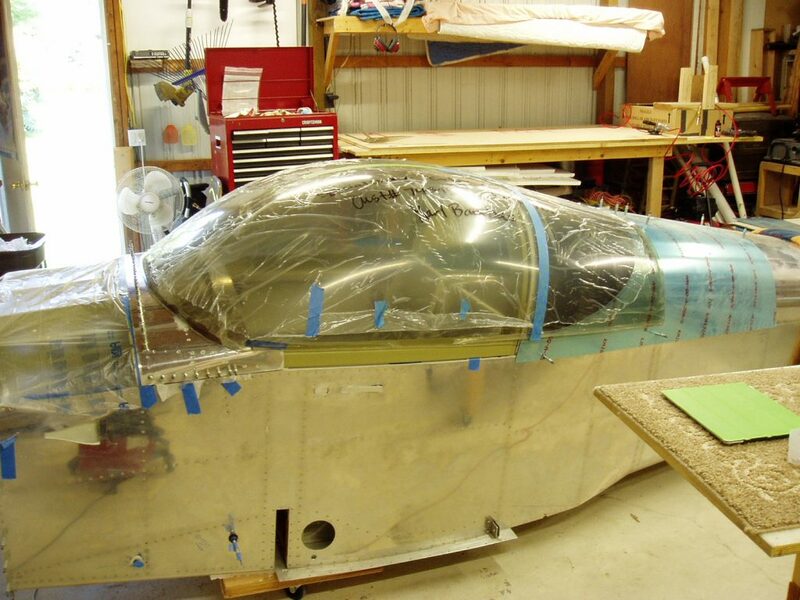 The top front skin was then removed and set aside. Canopy parts were sprayed with AKZO primer. Love that stuff. 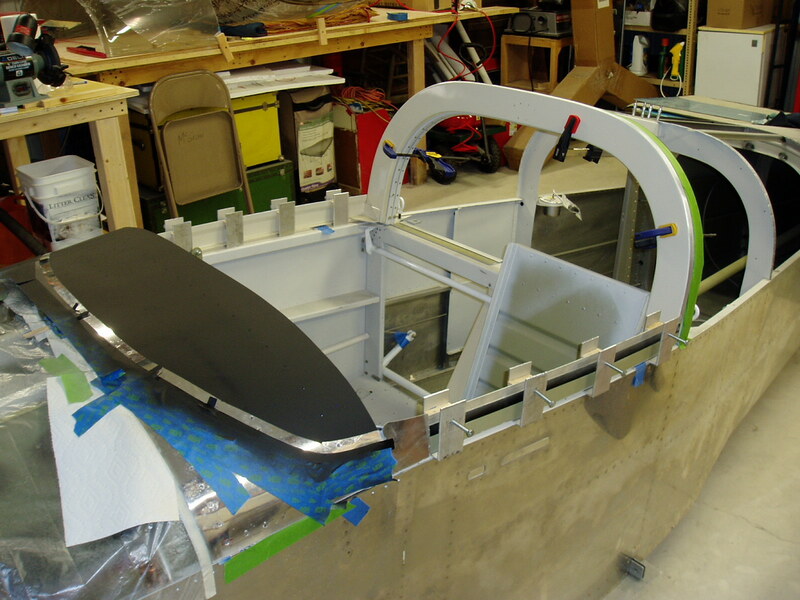 Side rails and rear bow were riveted to the canopy frame. With only the two front hinge pins holding the empty frame it is very wobbly. The canopy was moved from it’s airport crate to the home shop. The front edge was trimmed along the vacuum molded clamp line (die grinder birthday present from Dolly). 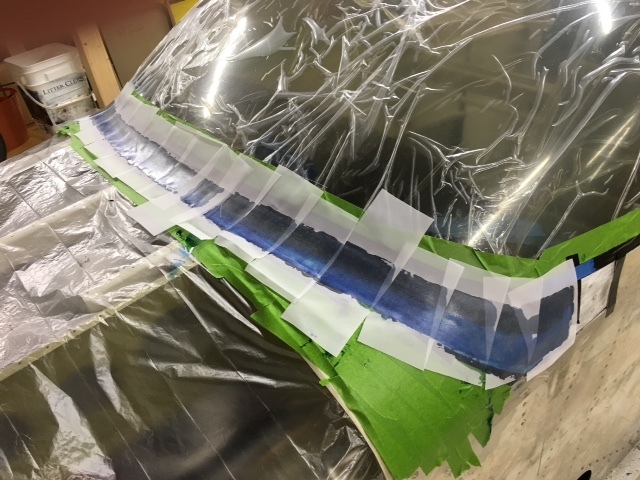 Blue tape across the top shows where “the big cut” will be made, severing the canopy from the rear window. It begins to look like an airplane! Following the lead of other builders who glued rather than bolted the canopy to it’s frame, I made eight clamps that will push the canopy to the frame while glue is curing. We used the SIKA glue system. It consists of a cleaner, a primer and the glue. The surfaces are prepped with 80 grit sanding, followed by a wipe-down with the cleaner. 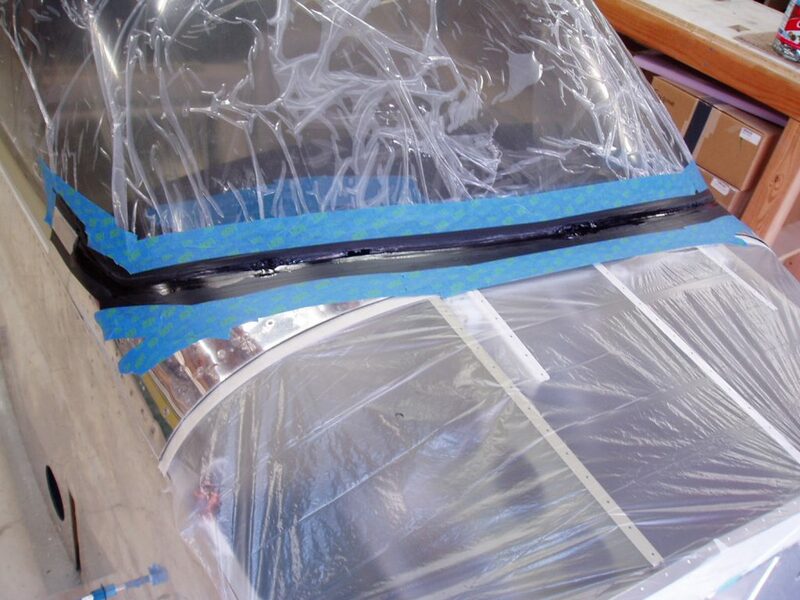 The primer solution is brushed on both surfaces and dries quickly. 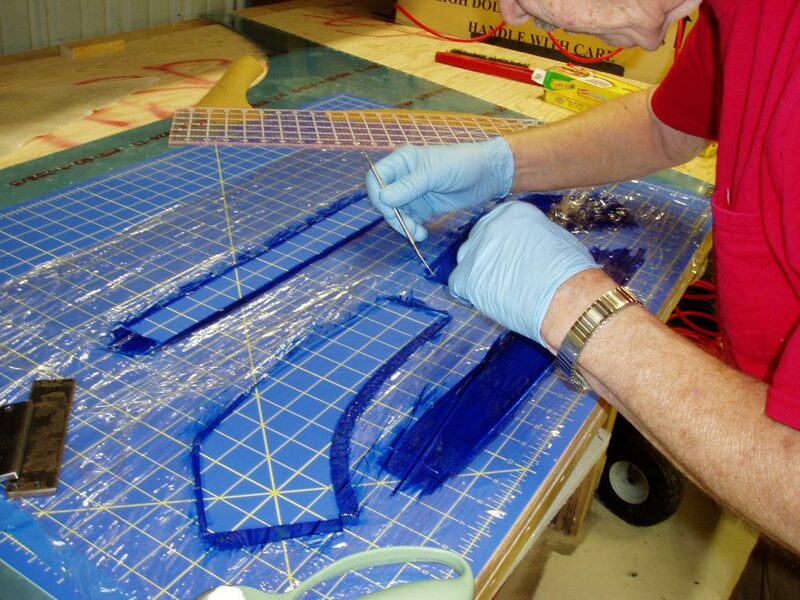 Within a half hour the glue is squirted from its tube onto one surface with a caulking gun. It skins over in an hour and cures in five to eight days. Painted the glare shield flat black and wire brushed the areas that will receive glue. 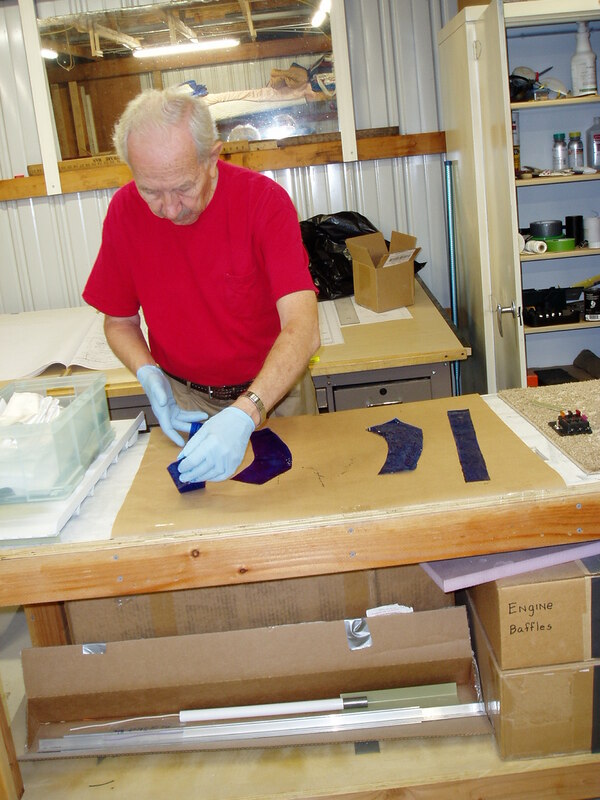 Adjacent areas were masked with paper tape or with black vinyl tape. 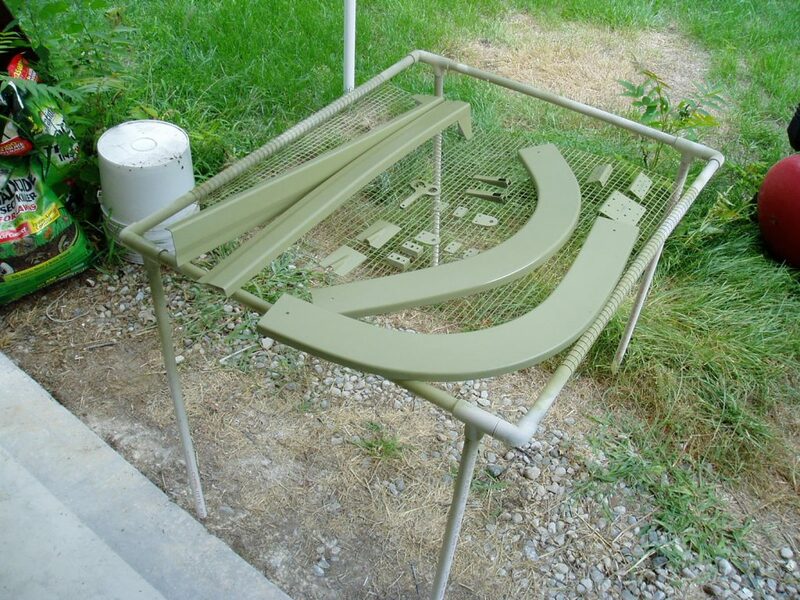 The interior canopy frame was sprayed with ‘Navajo White’ Rustoleum. Dolly, Michelle and I glued the canopy in an hour and a half. Plenty of rubber gloves were used. Note the canopy braces have not yet been installed to the forward frame. 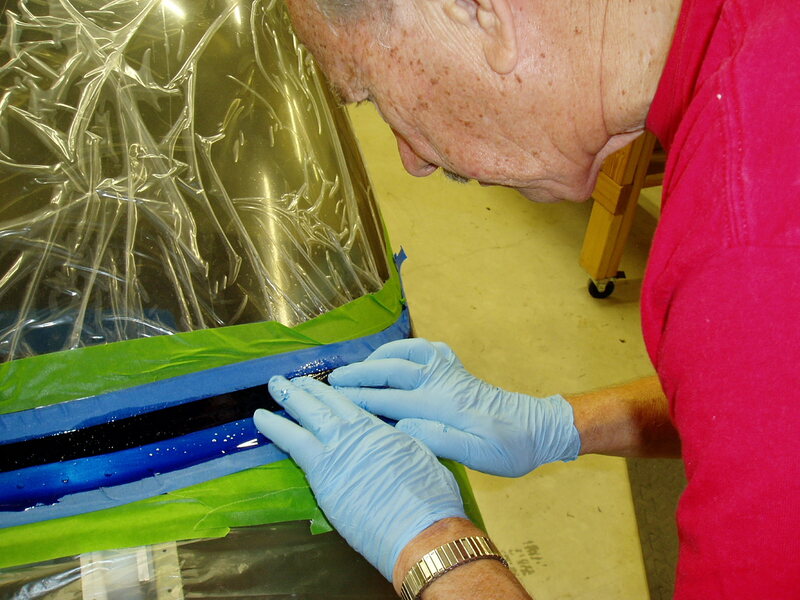 A second layer of SIKA glue was added as a filet at the front edge of the canopy. The “ears” on the sides of the front skin were also glued. A side “skirt” is glued and riveted over the outside of the canopy. 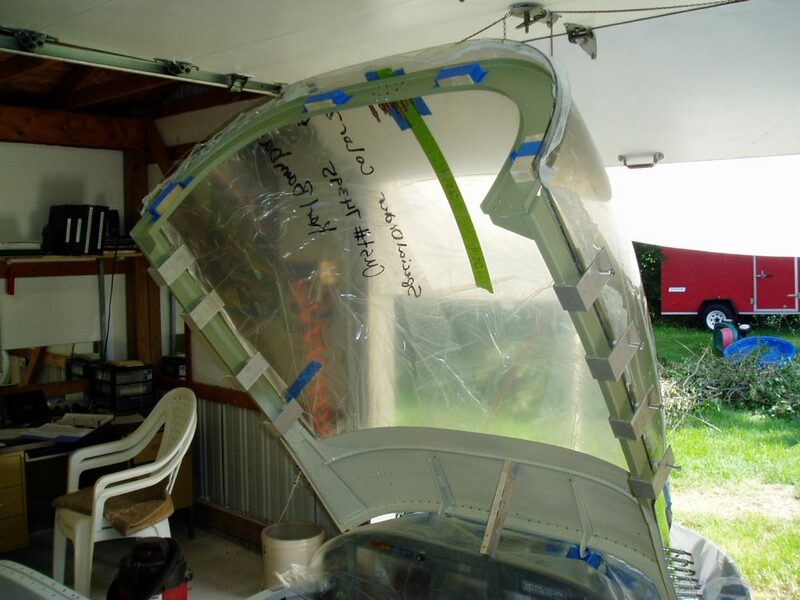 It’s purpose is to smoothly blend the canopy to the fuselage when the canopy is closed. As glued (or bolted), the front of the canopy surface makes a sharp transition to the front skin. 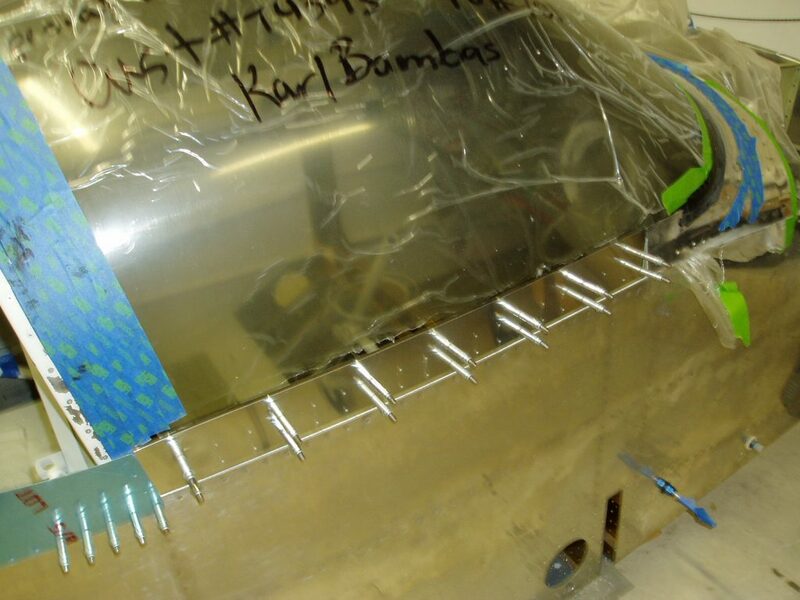 An epoxy/fiberglass fairing is built up from layers of fiberglass cloth strips. 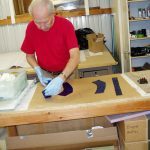 The larger top layer fiberglass pieces are laid on food wrap, impregnated with dyed resin, and covered with more wrap. The excess resin is squeegeed off the cloth. Then a very sharp “pizza wheel” cuts them to final size. 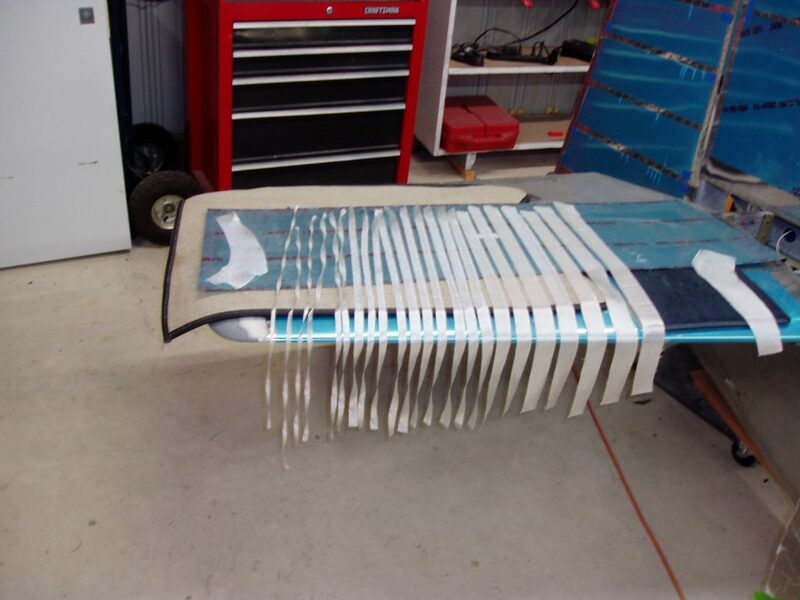 The last fiberglass layer was covered with strips of nylon sailcloth. 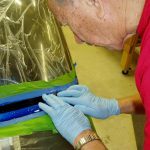 The sailcloth soaks up excess resin and can be ripped from the cured epoxy, leaving a surface ready for application of epoxy/micro-baloon finishing coat. 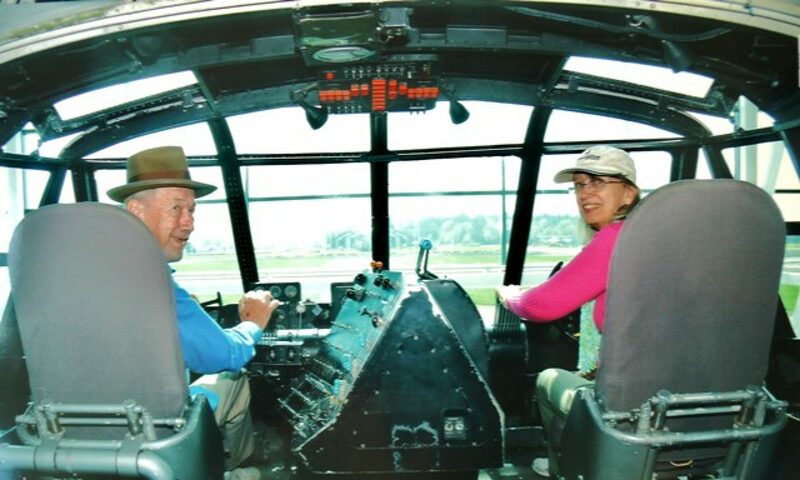 The fuselage was moved from our home shop to the airport on October 11th. Additional canopy finishing was done there. Photo stories for some of these items are in separate posts.